“Star Wars” creator George Lucas is pulling out all the stops for his upcoming art museum in Chicago, and we’re finally getting a glimpse of what it will look like. The museum, which will be called the Lucas Museum of Narrative Art, is being designed by Beijing architectural firm MAD, which recently revealed its preliminary design concepts. The structure is almost alien in its design, and will be constructed from a single piece of stone, according to The Verge, which is topped off by a metal “floating” observation deck that’s shaped a bit like a UFO. Inside, the museum will house illustrations, artwork, and movie props taken from the personal collection of George Lucas, and will focus on exposing people to both the process and ideas behind story-based, narrative art. The disk-shaped observation deck will reportedly include a restaurant, and will allow for a beautiful panoramic view of downtown Chicago and Lake Michigan. 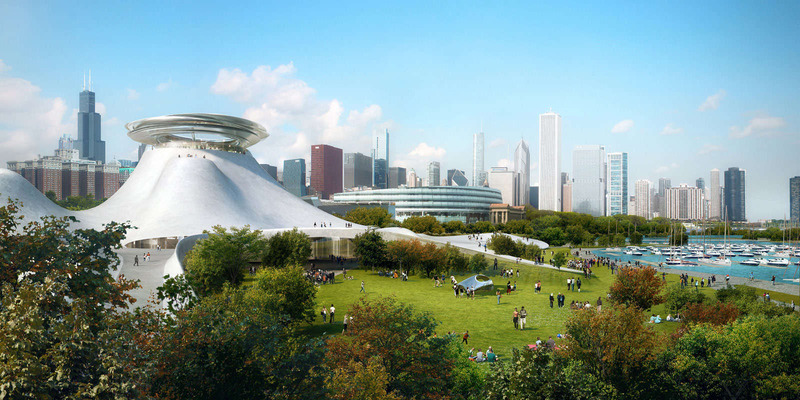 The Lucas Museum of Narrative Art is scheduled to open its doors in 2018. Learn more about the museum’s mission and design over at the official website.